This book traces the history of the defense of the KJV and the Received Text from 1800 to present. The book includes hundreds of testimonies and biographies; sketches of churches, schools, and organizations that have defended the KJV; a digest of reviews and condensations of major books and articles written in defense of the KJV in the past 200 years; excerpts from rare books on this subject which are no longer available; a comprehensive overview of the varied arguments in favor of the KJV. 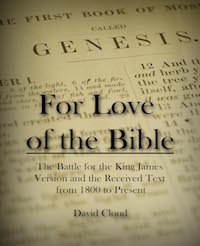 For Love of the Bible also gives a history of the modern English versions, beginning with the English Revised of 1881. Also included is a history of textual criticism, revealing that most of the textual scholars from the 19th-century on were rationalists who denied the infallible inspiration of Scripture. The 46-page annotated bibliography is the most extensive in print on the subject, to our knowledge. A detailed index is also included. The author spent several thousand dollars researching the book and has written several hundred letters in this connection, communicating with men from around the world who stand for the KJV today. Michael Maynard, author of A History of the Debate over 1 John 5:7,8, wrote: “For Love of the Bible is a masterpiece. It ought to be in every academic, public, and special library in the world.” 4th edition, March 2006. Book: Softcover, 518 pages, 7 x 8.5 in.